Oushak rugs originally came from the small town of Oushak (Ushak, Uschak), just south of Istanbul, Turkey. Oushak has been a center of production of rugs since the 15th century and today these beautiful area rugs are produced in Iran and India as well. The design of Oushak rugs are Persian influenced. Before the 15th century Oushak rugs were woven by nomads for practical everyday uses. After the design revolution took place in the late 15th century, area rugs were made in Oushak for commercial purposes as there was easy access to superb wool and natural dyes. "Patina" (above) is woven with the finest wools in a classic Oushak style. A soft, beautifully muted color palette combined with subtle distressing adds an updated, though authentic, look to the collection. Hand-knotted in India using 100% wool. These rugs tend to be more loosely woven than other, more formal Persian rugs, and are always woven with the Ghiordes knot. 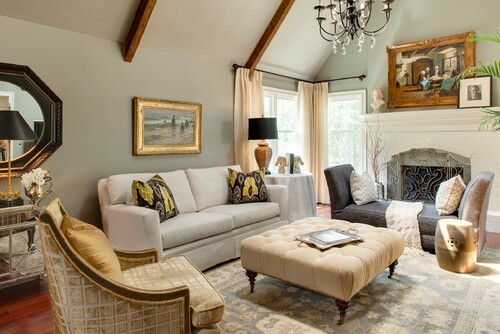 These rugs are equally appropriate for both formal and informal design schemes, as they tend to be subdued in tone and color, with some exceptions. These rugs are a perfect complement to Contemporary, Scandanavian, and Arts & Crafts (Craftsmen) style homes – especially popular in the Northwest. Visit any one of our showrooms to view our large selection of these lovely hand knotted rugs. 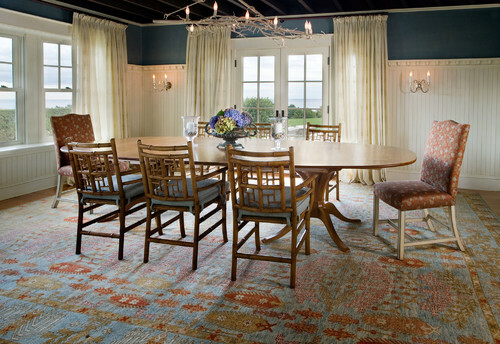 Also see a wide range of Oushak area rugs, both one-of-a-kind and production rugs in our online store.